The InterSystems IRIS Workflow Engine provides a much higher level of functionality than traditional, stand-alone workflow management systems, as the next subsections explain. “Straight-through” business processes (that is, completely automated business processes) can incorporate human involvement to handle exception cases, such as approval for especially large orders. An InterSystems IRIS workflow can call out to enterprise applications: to notify them of events within the human workflow, or to obtain additional information needed by the human workflow. Persistence: The Workflow Engine leverages InterSystems IRIS persistent storage features to support long-running business processes that may take days or weeks to complete. Business Process Designer: Workflow analysts can create workflows using the Business Process Designer, the InterSystems IRIS graphical editing tool that automatically generates full-fledged, working code from a business process diagram. In InterSystems IRIS terms, a workflow task is an item of work that is performed offline in support of an ongoing business process. InterSystems IRIS represents a task with a special-purpose production message object called a task request that carries information about that work. The workflow process sends task requests and receives task responses. As with all other messages, these messages are saved in the database until purged (if ever). In a typical organization, multiple people might be able to fulfill a certain kind of task. Therefore, to organize distribution of tasks to people, InterSystems IRIS uses workflow roles. 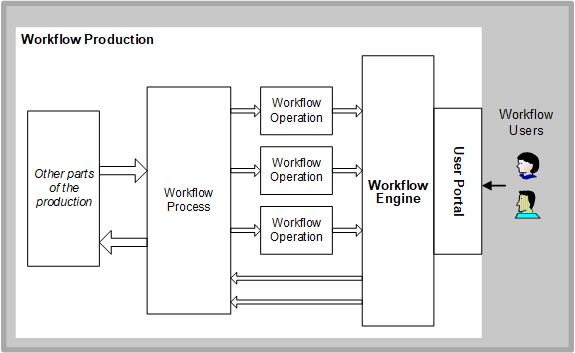 A workflow role is a list of users that can fulfill a certain kind of task. Workflow roles are defined per interoperability-enabled namespace, not per production. This means that the same workflow role definitions are available to all the productions in the same interoperability-enabled namespace. The same is true for workflow users when they correspond to InterSystems IRIS user accounts (as is typically done). InterSystems IRIS now provides two user interfaces to support workflow. These are intended for different sets of users. The Management Portal provides pages that implementers and supervisors can use to manage workflow roles, users, and tasks. To access them, select Interoperability, click Manage, and then click Workflow. For details, see “Managing Workflow Roles, Users, and Tasks” in Managing Productions. For details, see “Using the Portal Features” in the Using Dashboards and the User Portal. Task distribution follows either the default strategy or a custom distribution strategy. See “Task Distribution Options,” later in this chapter, for details. If the enterprise wishes to use in-house technologies to drive the user experience, InterSystems IRIS workflow tasks can be exposed to such technologies in a variety of ways, via XML documents, web services, .NET, Java, or as relational structures.